“Tea : aromas and flavors around the world” is written by Lydia Gautier published by chronicle books. This is a big book and is beautifully lavished with photos all related to tea. This tea book concentrates on the evolution of tea; its taste through the centuries. The book delves on the history of tea and its practices and customs associated with tea consumption. Other chapters include the alchemy of tea; the processing methods of the different tea and a interesting write up on the aromatization of tea. Later chapters deal with tea tasting, subtle affinities of tea, recipes for cooking with tea and an address book on all the tea merchants and tea rooms of the world. Cick the pix for enlarged views. “The effects of tea on the assimilation of iron – It is often said that tea prevents the successful absorption of iron, and for this reason pregnant women are advised against drinking it. During digestion certain polyphenols do in fact remain undigested by the organism and form complexes with iron ions (that is to say, they absorb them). As a result the iron available to pass into the blood during digestion is heavily reduced. However, once it has passed into the blood there is no further interaction with the polyphenols, which are digested and also pass in to the blood. It is therefore simply a matter of consuming sources of iron separately from drinking tea or of waiting some time after meals before drinking tea”. My comments on the milk article above is that so far in Asia where I reside and all the places I have visited (Americas and Europe), all the people I know and saw pour their milk to their tea (when the tea is drunk with milk). Nonetheless, this book is very well researched and the pictures therein are outstanding. A recommended read. Mooncakes are eaten by the Chinese during the mid autumn period of the chinese calender. The story below will try help explain the story behind these cakes. During the Yuan dynasty (A.D.1280-1368) China was ruled by the Mongolian people. The people were unhappy with the occupation by foreign rulers. The leaders of the rebellion, knowing that the Moon Festival was drawing near, ordered the making of special cakes. Baked into each moon cake was a message with the outline of the attack. On the night of the Moon Festival, the rebels successfully attacked and overthrew the government. What followed was the establishment of the Ming dynasty (A.D. 1368-1644). Today, moon cakes are eaten to commemorate this legend. Mooncakes are no bigger than a size of a man’s clenched fist. It is usually filled with lotus seed paste or red bean paste. These fillings are sweetened. For the more expensive cakes, salted hardboiled duck yolks are found within the cakes (see pix). The cost of each cake is about US$4-5, An order usually comes in a box of 4 moon cakes. Nowadays, to cater to the younger market, mooncakes now come in a myriad of fillings ranging from ice-cream, yogurt, cheesecake and even chocolate fillings. Traditionally mooncakes are eaten with chinese tea. My uncle love his mooncakes to complement tie guan yin. I fully agree with him on his choice, even though I think pu erh (both raw and ripe) and oolongs will also be good choices with mooncakes. The mid autumn festival this year falls on 3 Oct 2009. Nuff’ said ….. time to eat the mooncakes. Ripe pu erh tea is tea that underwent fermentation (usually about 6 weeks) during the processing of this tea. The purpose of the fermentation is to make ripe pu erh tea to have similar taste / flavor as aged raw pu erh tea. This means that your raw pu erh, which you and I are keeping and storing, will mature in 15/20 years to a flavor similar to that of ripe pu erh. According to a few tea shops and tea drinkers, I was advised that ripe pu erh is to be drunk after 2 years from the production of the tea. This time period will remove the mild scent of the fermentation (known as “wodui” in chinese). Raw pu erh, given under similar advisement, was also to be drunk after 3 years, to remove the sharpness of the tea. I have read comments in tea forums as well as from my readers of this blog that aged ripe pu erh tea(10 years old) is really good. My thoughts on this matter is that when you store ripe pu erh, this tea will continue to ferment naturally over time. Aged raw pu erh will however, still be the gold standard for pu erh tea as the time and effort involved in storage of the raw pu erh (15-20 years) is considerable compared to ripe pu erh. I enjoy both ripe and raw pu erh. However, I drink more from my ripe tea collection as my raw pu erh tea lot is less than 10 years old. Pix shows a 2008 ripe menghai. This is a new recipe from menghai where aged maocha is blended with the new leaves to produce this cake. 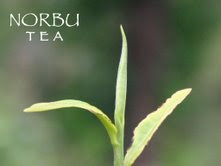 Norbu Tea is an online Chinese tea company operating out from Dallas, Texas in USA. 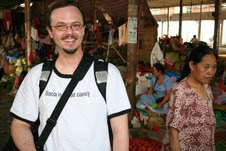 The proprietor of this company is Gregory Glancy (yes, he is the one in the pix). He sells chinese tea and tea accessories like teapots, gaiwans and tea sets.Gregory tells me that he personally source for all the tea he sells in his store. I am privileged to have an interview with him (via email). I posed some questions to him and his answers shown below are unedited for your information and reading pleasure. 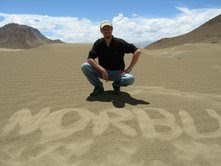 Norbu tea’s website provides good information on tea and the brewing aspects of different teas. You can also sign up for a e-news letter. Payment for your orders is done through paypal. Speculating of Pu erh tea - a myth? In spite of all the hype that pu erh tea will the next hot thing. Let me give you my thoughts on this matter. For discussion sake, lets take a 20 year old pu erh cake as a yardstick. A late 1980s cake would fetch about US$400 in today’s market. Buy a new pu erh cake (about $25) today and the money question is whether you can sell your tea cake for $400 20 years later (assume no drastic inflation or revaluation of the currencies). The answer would be NO because there are now many tea collectors in the world that are keeping these cakes. This is unlike the late 1980s cake that is now extremely limited in supply as there were few tea collectors then, and people that time drink than hoard their tea. Good news are that your new tea, if kept in proper storage conditions, will see its price appreciate in 20 years. I forsee the price of our current cakes to be about 4-5 times the current value in 20 years time. I see this as a fair price appreciation as the price would also justify the effort and space spent in properly storing this tea over a 20 year period. I would like to stress that you must know how to store your pu erh correctly so that you will have aged pu erh after a period of time. Pu erh tea stored incorrectly will be worthless. I am storing some pu erh tea (2003-08) for a 15-20 year period. I wish to drink aged pu erh tea in 20 years time without paying too much for the tea. More on my tea collection next time. Awazon is another tea supplier (also on ebay) which I get my tea. This company operates from Kunming, China. They sell mainly teas that come from Yunnan. Awazon has a good range of tea mainly pu erh. Awazon is run by a husband and wife team (surname zhang). Both are knowledgable in pu erh tea. They have produced their own housebrand of pu erh tea, and have received very good reviews in the local Kunming papers on their jingmai and manjing cakes. Overall, I have found their tea prices and packaging satisfactory. My recent order from Awazon arrived in good order. You will observe from the pix that the packing is generally acceptable. The tea is well packed to prevent movement during transit (so you will not get broken cakes). In addition the tea cakes are bubble wrapped and sealed; ripe and raw cakes are separated. A pack of yunnan "white hair silver needle" tea also came packed in an aluminium foil. Tea joke - What is the teapots' fave movie ?